The city of San Marcos has teamed up with the Fort to create a Green your Space event. The event will be Friday, Nov. 17, from 3pm to 10pm and will feature live music. 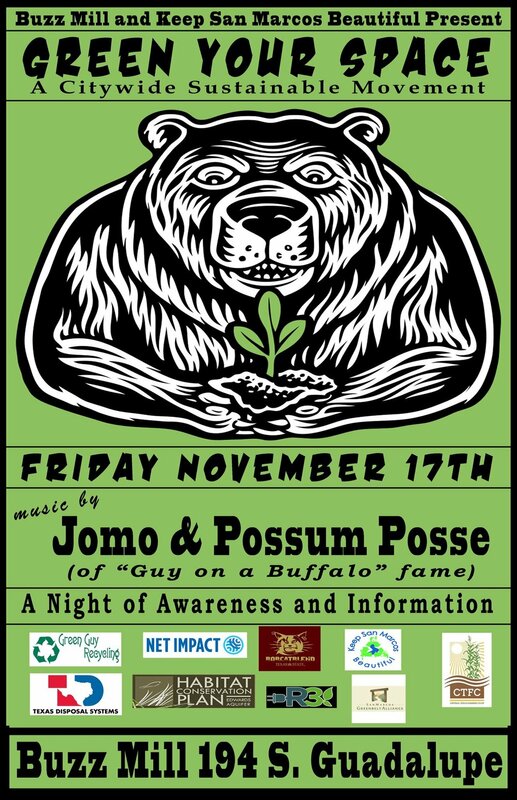 Jomo & the Possum Posse, creator of "Guy on a Buffalo", will be performing live music on our frontier patio out back. Organizations will be set up out front; Green Guy Recycling, Net Impact, Central Texas Farmer's Co-Op, Texas Disposal Systems, Habitat Conservation Plan, Keep San Marcos Beautiful, and more. These organizations will be providing information about keeping our planet healthy, sustainable living and recycling without using handbills, flyers or cards. You are encouraged to take photos, digitally store information and follow up online with the groups. Join us for a night of awareness and information.